Love that periodic chart! What a score! Agreed, would love to have that hanging in my home. Absolutely gorgeous piece. Beautiful space, love all the colors. Thanks for sharing. No problem, had to share this one along with their current home, so amazing what they did with such a small space and creativity. YAY this almost makes me miss our tiny studio! It was very cozy (and the rent was half what we're paying now! oof), and made the perfect jumping off point for figuring out our style after college. Also, you would not believe how many emails we've received asking about buying our periodic chart of the atoms... but we love it and it's not for sale! That's the other benefit of small spaces I left out, rent is usually MUCH cheaper and it's great way to funnel more money into savings, we don't need as much space as you'd think. I'm lucky to have scored an amazingly spacious yet low-cost apartment I share with a roomie to keep expenses quite low. Aren't they adorable? Cutest couple ever and they are so clever with all their living arrangements. Even though I gotta say this one is my favorite! Its just so well put together and very inspiring. Their new place holds a close second and I think its going to be interesting to see how they work it over time. And DUDE!! Seriously your etsy just totally grabbed my attention it looks freakin awesome! Your hard work is paying off! My Etsy shop or theirs? ;) I was killing myself working behind the scenes doing- re-staging as much as possible in Christmas theme and working really hard on composition/editing trying to learn new techniques, etc. Thanks if you're talking about mine! This studio space inspires me to cozy up my current apartment which is huge with high ceilings and after a recent purge kind of stale. Needs some rugs and some classic pieces to tie the space together! Yours! I even went and checked it out. Your Christmas pics are genius especially since you got general pictures so you can take down the Christmas afterwords. Truly stunning! I hope it pays off for you. You deserve it! They did a super job! Even a piano (or is that an organ?)!! Really like the white (painted?) curio shelf. The white really looks great on that-- clean and more modern. Thanks for visiting my snoozing blog too! It is an organ! The Wurlitzer Funmaker Special to be exact :) Got it at a yard sale for $10 and had way too much fun with it; we eventually gave it to our friend who is an experimental musician, so we still get to visit it and he can actually make crazy cool stuff with it. Also, I painted that shelf white! We sold it when we were downsizing, but we kindof need another one to display all our little things now! Corrected it in the post too, oops! I loved the painted curio shelf too, looking for a more of those to display ample collections! 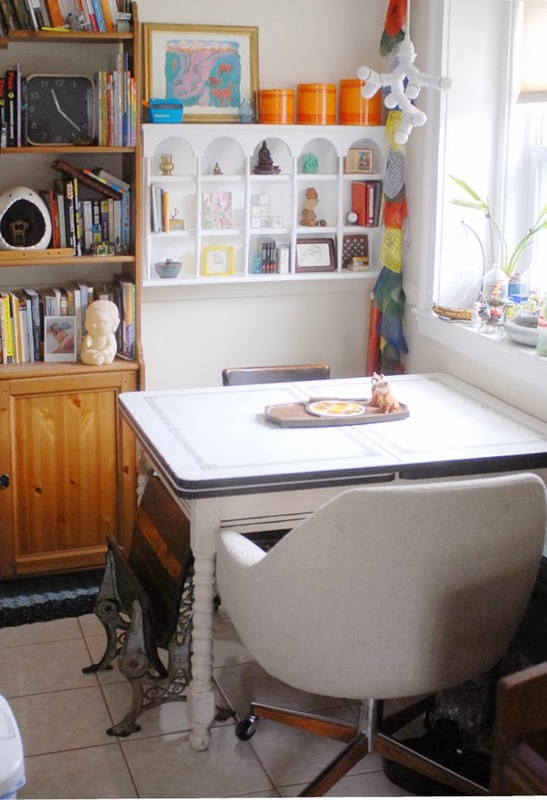 Adorable and cozy, love the kitchen table and the light that streams into the room. 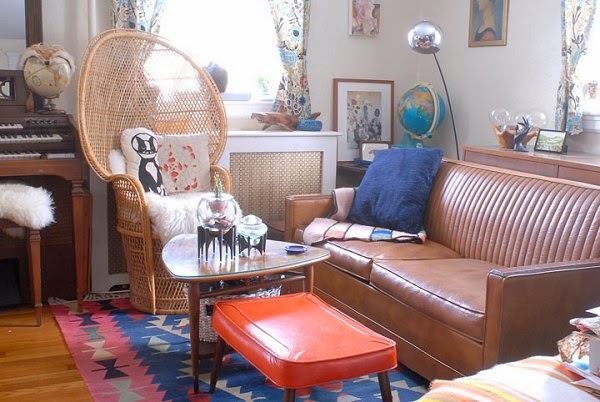 when You speak of small space I always think of IKEA and how they make those very small living spaces, love walking through their show rooms, just for arragement ideas, but it can't beat the great vintage finds to make a house (or studio) a home. I thought of that too, actually. 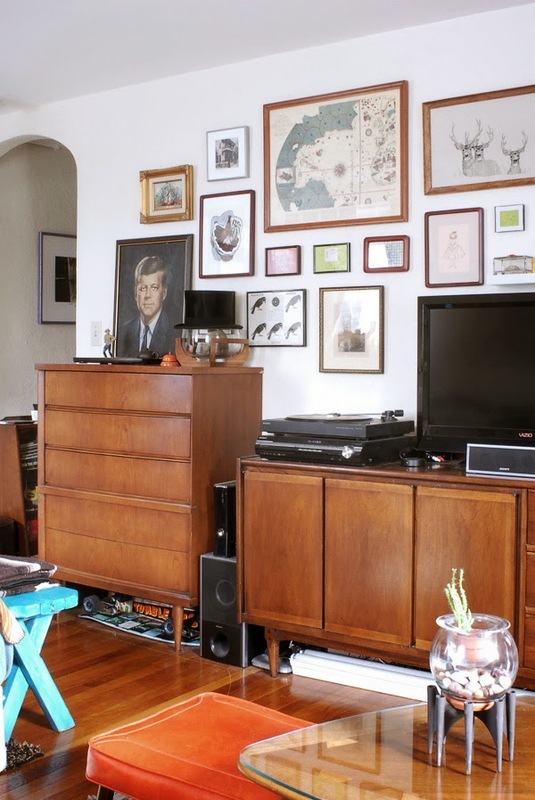 Those are always inspiring for thinking up storage solutions! I LOVE their dining area! No prob Dee, agreed they have so many beautiful pieces! Great use of space. Seriously, great use of space! We just upgraded from 600 square feet to much larger and I miss the coziness of smaller spaces-everything filled in so much nicer. 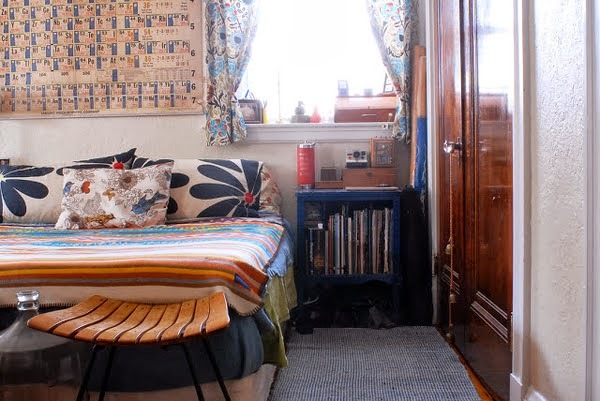 Everyone who visits likes this new roomier/more modern apartment better but I do miss how photogenic/effortlessly cozy my smaller space was. 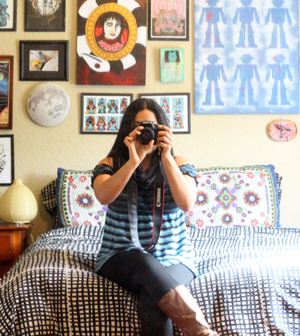 You have to be more creative to create the same vibe with a bigger space. 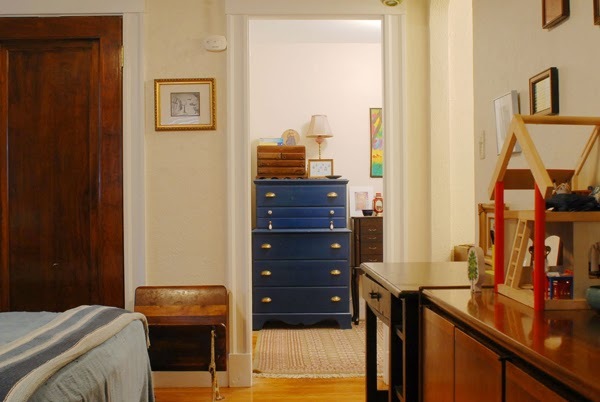 BUT with a bigger space there are far less storage/working frustrations. 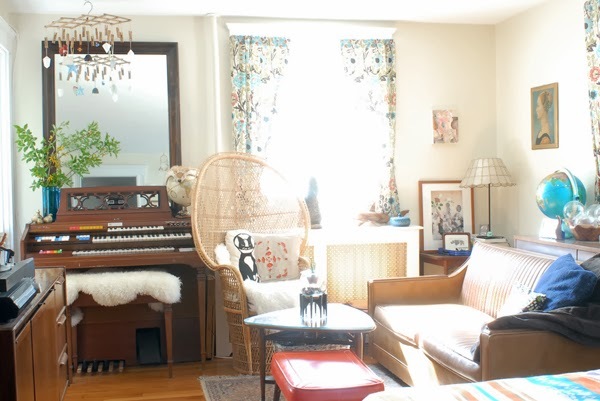 I am In Love with this studio apt. "Effortless coziness". It's what I long for. Yep! Saaame here. Looks like I need some rugs and throws, mine is quite sterile after a recent purge. Amazing use of space. I wouldn't have known it was just one room divided into separate areas had you not told us. Love the periodic table. 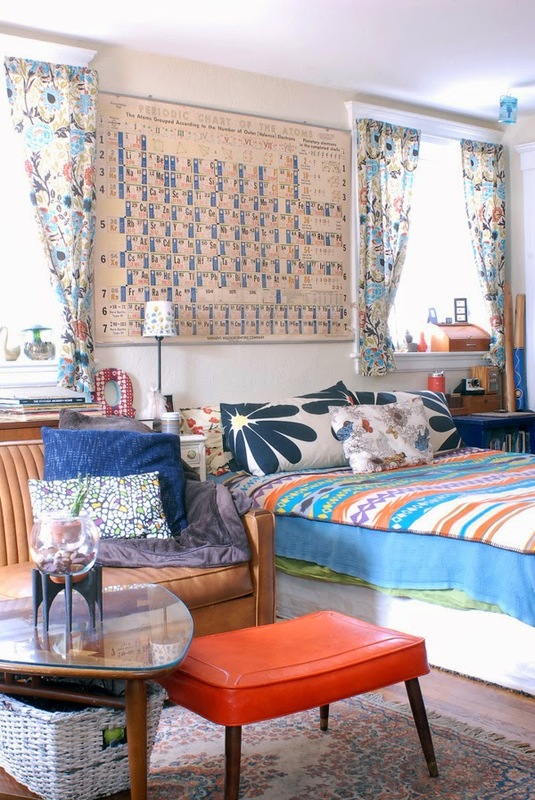 Who knew a vintage piece of science geekery would look so attractive? All science geekery is beauty to me :D But yes, this inspires me to work with my own comparatively massive space better! I would have to get rid of about 75 percent of what I see, but I would love what's left. 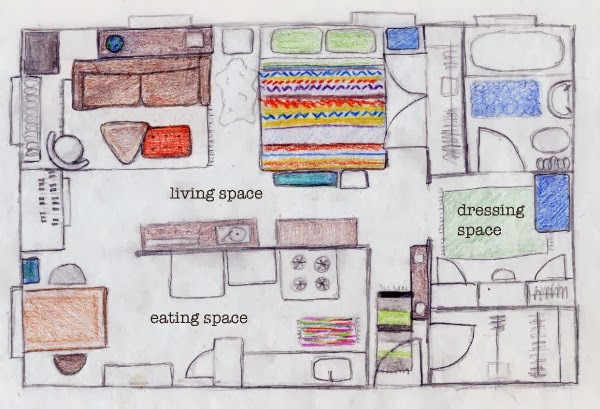 I live in under 600 square. I don't do a lot of pattern and the colors are limited. Keeps me from not going bonkers. I'm a maximalist and minimalist combined. 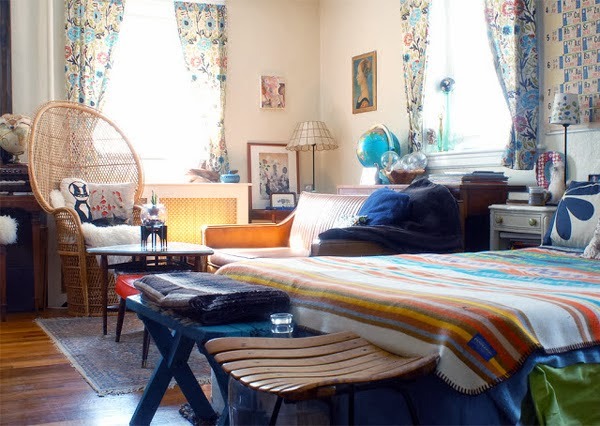 LOVE the cozy of stuff..yet loathe clutter in my own space. I'm particular about layout. Luckily my roommates don't care and let me be crazy.